The outbuilding behind the house has been seeing a lot of activity recently. We refer to it as ‘the studio’, because that’s what it is: a big old monster of a space which was originally a potter’s studio, then a place the previous owners (well, one half of them) worked on his incredibly accomplished sculptures and oil paintings. There’s much evidence of its past lives. The old Belfast sink in the little wood-panelled kitchen area, the heavy easel in the far corner, the antiquated and heavy draughtman’s desk by the window. Unfortunately though, the roof is moss-covered asbestos and the windows need replacing. The floorboards in the lean-to part are springy and, I suspect, rotting. There are great blooms of mould across the ceiling and up the walls. If you leave anything in there too long it develops a fine coat of downy mildew. Well, if you fire up the stove and open the windows the place is (almost) transformed. It gets very warm very quickly. The leaves blow in and whirl about on the floor. The big window in the main part of the building looks out onto the garden, the stream and beyond to the croft next door. So recently we’ve had a couple of parties in there, and in between revelries I tend to duck in and out. Once upon a time I used to live by some woods. The garage was tacked onto the side of the house and was actually too small for a car, but I used to like going in there. Other than cobwebs and piles of dried leaves and some snow chains (it was also up a steep hill), it was empty of the usual garage detritus. That kind of space, somewhere between indoors and outside, holds a strong appeal for me. You can feel the wind coming in and smell earthy smells. You can potter with plants and not worry about spilling compost on the floor or brushing deadheaded bits and pieces from the tabletop. It doesn’t matter if the rain comes; you can carry on regardless, lost in a little world, the door open to the elements but you staying just out of their reach. So that’s what the studio is for us right now. Somewhere to just be for a little while. And that old table, pocked with woodworm holes and smeared with faded oil paint, is in just the most perfect spot to catch the light. 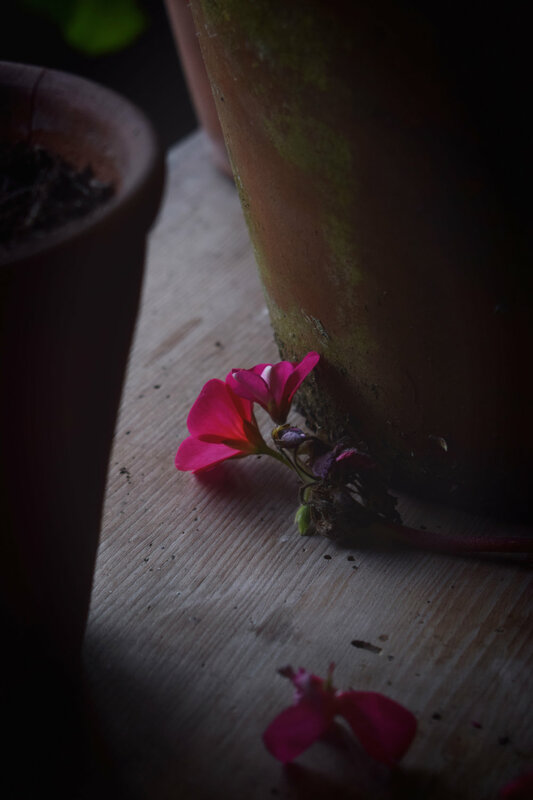 It’s good for taking photographs and it’s where my geraniums are currently residing. Those plants are very important to me. Some belonged to my mum, and I keep them going by taking cuttings and bringing the bigger ones indoors once the nights get cold. I’ve also been planting bulbs; hyacinths and paperwhites for (hopefully - if I’ve timed it right) Christmas, and miniature daffodils for the big stone pots either side of the front door. There’s been much agonising about what we actually do with it. The plan has always been to use it as a workshop space for me to run classes from, and to have Open Studio days where people can come in and browse. From a non-commercial point of view I’d also love to host regular gatherings for locals through the winter; maybe a reading group and various craft sessions. But before all that the place needs serious attention. Basically, it either stays and gets a full refurb (new roof included) or pulled down and rebuilt. It’s a big decision and an expensive prospect no matter how you look at it. And getting a decent buider on Skye isn’t easy as they’re very much in demand. Lately I’ve been worrying about this house. It’s big, it’s old and it’s listed. There are certain bits I daren’t investigate further for fear of what I might find. What’s all that woodchip hiding? When will the chimney man come out to stop the mortar crumbling? Can we borrow a chainsaw and sort the gargantuan trees out that are overshadowing front garden by ourselves? It would be nice to replace the sash windows with new, non-draughty ones (££££££). The gutters need clearing again. And don’t get me started on the noises coming from below the floorboards (the pest control people are coming out to us - probably mice. It can’t be rats. I refuse to entertain the idea that it could be rats). We walked in, we fell in love with it. So spacious and full of character, so much potential, and it felt like a real home. But now, I have this dread that we’ve bitten off more than we can ever afford to chew. I know this is a journey, a long-term project and we’re right at the very start. Jay’s the eternal optimist whilst I tend to veer on the side of cup half empty. Last night I’d convinced myself we’d have to tidy the place up and sell it. And yet this morning… coming in through the gate and up the drive, casting a concerned eye over the flaking paint and potential *shudder* rodent entry points, I still had to admit to myself that I do love this big old liability of a house. We can live with ramshackle and we can chip away, have a go ourselves at the less scary stuff and somehow make the house pay its way a bit - we’re thinking of doing some B&B using the old ‘maid’s room’ above the kitchen.